GC36 delegates begin the days of murmuratio. It is a time of soul searching, prayer and inquiries about possible candidates for the next Superior General of the Society of Jesus. We are now at the heart of the murmuratio. What may have struck you about these four days is the way in which the electors meet other, two by two, without a list of candidates for the office of Father General. But what is uppermost in the hearts of the members of the Congregation is the atmosphere of prayer that pervades these days. 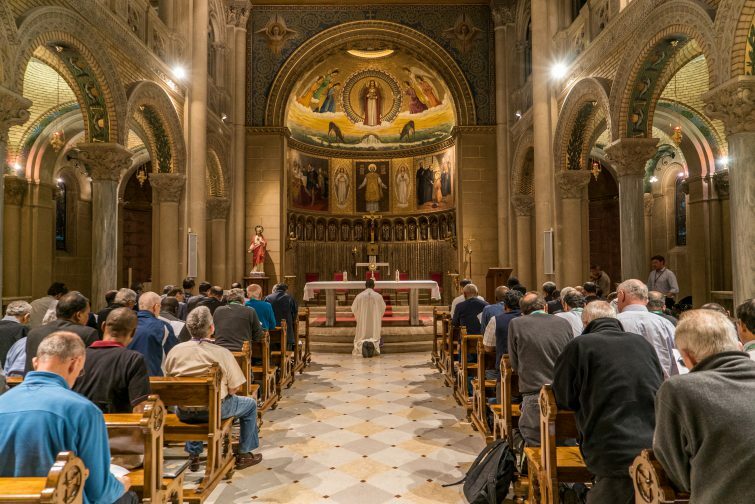 Beginning yesterday morning (October 10), after the customary morning prayer in the Aula, the Blessed Sacrament was exposed in the main chapel of the General Curia. Day and night, in an atmosphere of silence, the electors take heed under the weight of their responsibility of the information they have gathered from their interchanges. A chant from Taizé: Jesus, the Christ, light within, let not the darkness speak to me; let me receive your love. A prayer to the Holy Spirit: Come, Spirit of silence and of calmness; lead me to Your interior peace. A common expression of devotion: My Lord and my God. A period of silence ending in the acclamation Adoramus te, Domine (We adore You, O Lord). The Tantum ergo, a traditional hymn for benediction of the Blessed Sacrament. A hymn in honor of Our Lady that is often used in meetings of Jesuits, the Salve Regina. During these days we invite all the men and women who are united with what is taking place here in Rome at the General Congregation, to share in the same spirit of prayer. To unite yourselves with the electors visit the “PRAYER ROOM” (click here); you will find there the texts and the videos of the morning prayers. You can add your own prayer or your own remarks. Thank you all, and our thanks to all who support with their prayers the prayer of the electors!